Don’t get me wrong: I’m very much about the look of the Aston Martin DBS GT Zagato rendering. I just also think it looks like a very sleek fish. This isn’t a bad thing. 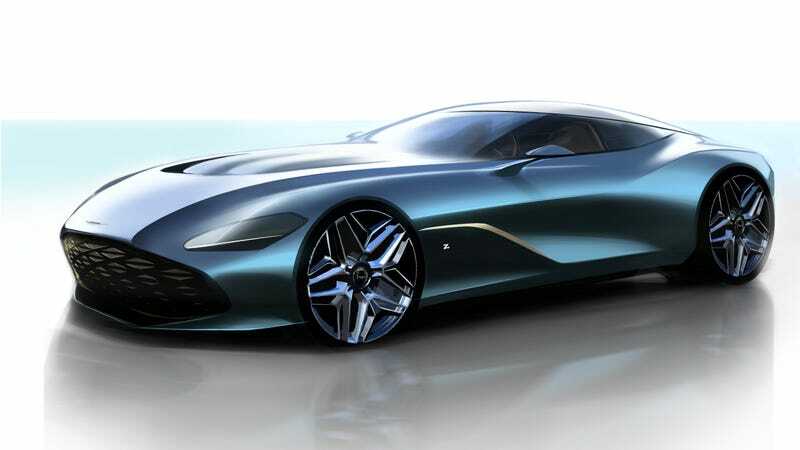 Aston Martin published renderings of the new DBS GT Zagato today, a car that marks the second half of the DBZ Centenary Collection, according to a press release. The project is, as its name implies, a celebration of Zagato’s 100th anniversary. The DBS GT Zagato is based on the stunning DBS Superleggera, a car that perpetually looks open-mouthed with surprise. Zagato’s design enhances the already sleek lines, implementing the iconic double-bubble roof style that extends from the top of the wraparound windshield all the way to its tail. That double-bubble design can also be seen on the hood. DBZ Centenary Collection is Aston Martin’s own way of celebrating nearly 60 years of collaboration of the famed Italian design house. The collection is made up of extremely limited edition cars that consist of this DBS GT Zagato (street legal) and the DB4 GT Zagato (track only). The DBS GT Zagato is still just a rendering. But the other half of the project is the DB4 GT Zagato Continuation—a revival of the classic car on a tube-frame chassis with handbuilt aluminum body work, a 380 horsepower inline-six and a four-speed manual, which is a hell of a combination. Aston Martin is building just 19 pairs of these cars, and you can only get them as such for £6 million (about $8 million). Deliveries of the DB4 GT Zagato Continuation will start in the last quarter of this year, while the DBS GT Zagato, built at the automaker’s Gaydon headquarters, will be delivered in the fourth quarter of 2020. I kind of feel like the two should be delivered together, but I can’t afford them so I guess I have no say. I—and likely you—will have to be content with merely looking.